It's out of beta now. An on-line VPP system Avalon Navigation (a French Company) will do a very decent job of creating polars for your boat, IF you can provide the detailed measurements required for hull, crew, and sails. Hull is by far the most critical and hardest. They DO provide over 250 example boats as maybe close fits to start, but note that small differences make for big errors. They are still tuning the results but as an on-line tool every week it gets better. It tends to under-speed boats that can plane. Like for BlueJ, who its does not believe will pop up in 20 knots. The two lines are typical; one is jib and main, the other is main and spi. BlueJs official polars look like this/ They get the upwind pretty much right. The free version gets limited wind speeds and plotted points. For 35 bucks you can buy their REAL product, a weather/wave/current router nav app, which is amazing and an amazing deal. Will Gilmore, StargazerP303, jon hansen and 1 other person like this. Thats pretty cool, especially for smaller boats without navigation systems. As a data guy my first thought would be to record the wind speed, record apparent wind direction, heading, and speed over ground, etc. With this use regression to report polars with observed data, seems easy for larger boats with electronic installed. The report would be specific to the boat measured, versus an ideal boat. Yes, if you are interested in polars that show what you actually do in your boat vs what it SHOULD be able to do, then generating polars based on observed performance is a good idea. And maybe the best idea if careful measuring is not possible! iRegatta Pro, interfaced with wind and speed instruments via WiFi, can collect, trim, and reflect this data automatically to generate polars. Will Gilmore, jon hansen and tfox2069 like this. Very nice. Glad it came out before our boat launches so I can take the underwater measurements. I have the iRegatta numbers so I'm curious as to how they compare. Am going to work on this over the season. Thanks for the pointer! Jackdaw, Will Gilmore and tfox2069 like this. .......BlueJ, ......[blah blah]......will pop up in 20 knots. This looks like an after tax season project, I think. I find this post very interesting, but I'm curious about the data contributed by sog? Wouldn't that throw off the overall view? I mean, unless you're on a currentless lake. Who said anything about SOG?? I did not know that! Which model? I didn't see that on their NMEA2K 'Voyage Recorder'. Would be a cool feature. I’ve read thru the document, and sadly it’s more of a toy. It generates a ‘polar’ rose using apparent wind not true, which really limits its usefulness. And the resulting roses, which have to be generated manually one at a time for each wind speed, are much too crude for actual use. This looks great and I hope to get a chance to take specific measurements so I can have polars calculated for my boat. In the meantime, the C&C 27 looks like it is the most similar of any boats listed. It is good to have the default numbers from that boat as a check against my measurements. It looks like the trickiest mesurements to get might be max cross-section area, wetted surface, beam at waterline & displacement. It appears that I have the weight of the lead keel imprinted right on the keel, but light displacement seems like it would have to be from the brochure and the weight of cruising gear is going to be an outright guess. There is another thread talking about fairlead placements for head sails, so I am left wondering why this isn't a factor that should be included for calculating polars. Doesn't upwind performance depend heavily upon correct sheeting angles? Our boat has the fairlead track on the rail, which is far outboard of an optimal position, it would seem. Are these calculations based on the assumption that optimal sheeting angle will be manipulated by inhauls, or whatever, to correct the bad positioning that may have been built into the boat? 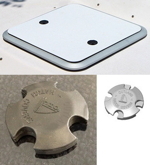 Polars always assume BEST POSSIBLE trim and sail area, regardless of placement of production hardware. That's one reason that boats that have published polars are normally focused on racing. They've been optimized. Nice! Now I have to get out the tape measure! Soooooooo.... polars are only useful to one person. Scott T-Bird, Jackdaw and Will Gilmore like this.